A cheesy delicious change of pace from plain mashed potatoes. Dress up your dinner with this flavorful side. 1. Preheat oven to 350 degrees F. Grease or spray with cooking spray, a 2 quart casserole dish. 2. In a 10 inch skillet over medium-high heat, cook onions and bell peppers in butter or margarine for 1 minute. Remove from heat and set aside. 3. In a 2 quart saucepan over medium-high heat, heat water, half-and-half and 4 tablespoons butter or margarine to boiling; remove from heat. Stir in both pouches of potato flakes just until moistened. Let stand 1 minute or until liquid is absorbed. Beat with a fork until smooth. 4. 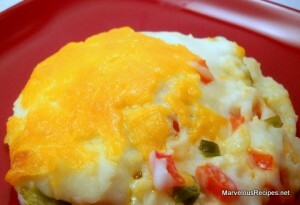 Spoon 1-1/3 cups of the potatoes into bottom of casserole; top with 1/2 the onion mixture and 3/4 cup of cheese. Spoon another 1-1/3 cups potatoes over the cheese and carefully spread to cover. Sprinkle evenly with remaining onion mixture and top with remaining potatoes; spread to cover. Sprinkle with remaining 3/4 cup of cheese. 5. Bake uncovered, 30 minutes or until heated through. Makes 8 servings.